Gamat Bay is the little sister of Crystal Bay, in a wilder version. It's like an aquarium, but with currents. Gamat Bay is one of Nusa Penida‘s jewels, but it is not as easily accessible as Crystal Bay. By road you can reach the top of the hill overlooking the beach. And then walk down following a fairly easy path. Gamat Bay is also a lot wilder. Which means you will probably not see anyone down there. Except for snorkeling and diving boats in the morning. If you want to snorkel from Gamat Bay beach, bring your own equipment. And do not forget your fins because the currents can be very strong, as often in Nusa Penida. Do not go too far from the beach and be very careful. We have already rescued with our diving boat a diver who was being driven out to sea. And who was very worried about her husband (“Help me, My husband, my husband”) who was quietly waiting for her at the beach … But if you respect all these instructions snorkeling is indeed very nice ! Gamat Bay is normally also one of the spots proposed by the snorkeling tours leaving from Toyapakeh or from Crystal Bay. In this case you will normally be perfectly supervised (if the tour is professionnal). 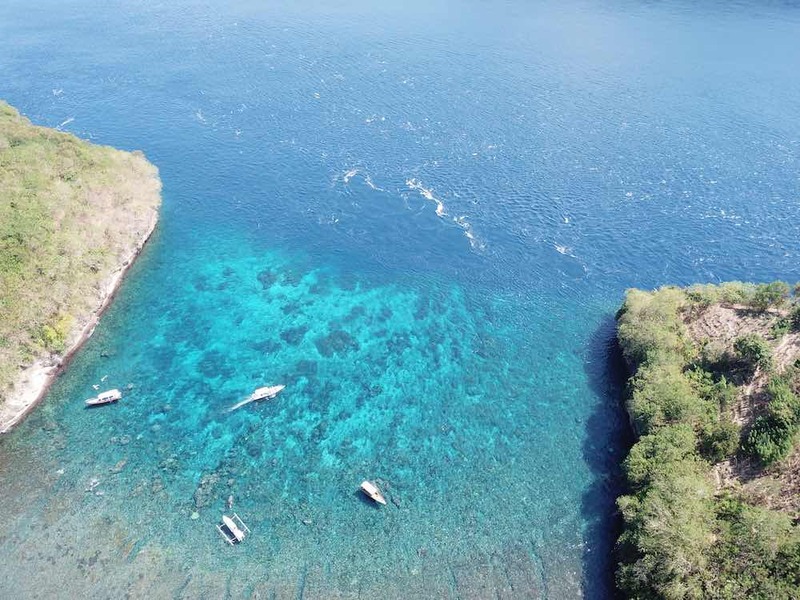 Gamat Bay is also one of the most beautiful scuba diving spots in Nusa Penida. Because the bay is a plateau about 8 meters deep, full of corals. And you will often see turtles as well. It is therefore a good place to make a discovery dive when conditions are good. Especially if there is no current at the time of the tide. And at the exit of the bay there is a wall that goes down to a sand plateau 50 meters deep. But there is no need to go that deep for a beautiful dive. You may also see bamboo sharks and marble rays. But pay attention also to diving conditions and currents. To be sure to dive safely and to get the most out of your fun dive, you can dive with Warnakali, the first PADI dive center opened in Nusa Penida. Ask for Yann who has dived more than 2000 times in Nusa Penida and who knows each spot as his pocket. The Warnakali dive center also offers diving initiation with a training in its three meter deep pool before going to sea for 2 discovery dives. To go to Gamat Bay from Toyapakeh you will take the first intersection to the right towards Crystal Bay and Gamat Bay. Arrived at a small fork you will take the small asphalt road to the right. There is a green sign that says Gamat Bay 1 kilometer. You will continue this road till the end. Halfway, the road is no longer asphalted. After a while and a concreete road going down you will see a small green sign that says Pantai Gamat. Park your scooter there, follow the dirt road going down to the right and you will find a very small path on your left, 20 meters before the end of the dirt road. If you follow the road till the end, turning left after the Pantai Gamat sign, you will arrive to Amok sunset bar and restaurant. The place you want to be to enjoy the afternoon around the pool or the sunset !